TREASURE COVE now available for sale - Check it out! I am proud to announce that I have been working with Brent H. AKA "bah" here on Atari Age and we are offering a remake of the Estoerica release of TREASURE COVE for the Bally Astrocade. Please note this is a reproduction cartridge and it has been fitted with an existing Astrocade Videocade style box from a different release. Edited by ballyalley, Tue May 29, 2018 11:19 AM. So it does come with the box? or just cartridge? Hi all. 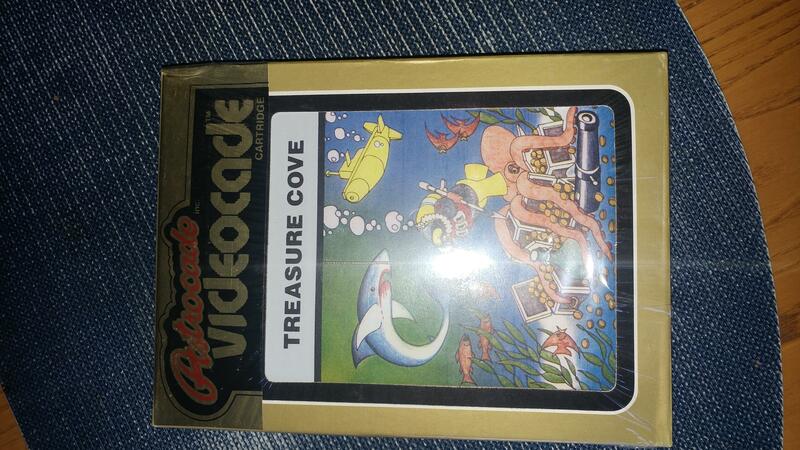 Treasure Cove comes as a cart and manual in an original Astrocade box. The manual cover is adapted from the original artwork on the Spectrecade box, but I think it works well with the Astocade box. Shipped packeged inside another box. 25$ for a boxed game? Yes please. Wow, how very cool! Fun little game. I have the cart already but I love the idea of Astrocade repros! Keep up the good work. It's nice to see Tim jump into the Astrocade arena. Way to go, man! For those that are curious, Treasure Cove is an 8K cartridge (the largest available for the system). The game was released in 1983. It was written by Brett Bilbrey, with sound by Marion Nelepa. I noticed that someone asked if War could be re-released. It's available (with permission) on the most recent Astrocade multicarts, but I'm not aware of Michael Garber, the programmer of Crazy Climber and War, being asked to have a re-release of either of his two Astrocade games. Well, because of the age of the Bally system, I never expected to see Treasure Cove re-released. But it is very cool that it has been. I love the color label for the cartridge. A very nice touch. Even though I programmed the game, I was never able to get through all the levels (it gets pretty crazy in the higher levels). I hope folks enjoy playing Treasure Cove. It looks like a brilliant reproduction and a steal of a deal. Ordered. Thanks! Edited by Bill Loguidice, Fri May 26, 2017 9:32 AM. Brett, Glad you approve. The label is still the original art but massaged a little and colored in. As of this morning, all orders have been shipped. I have 3 carts left I can build in original Astrocade boxes. There may be a delay because I am basically out of cartridges to modify. Mine came the other day, thanks! Have not had time to open it (celebrating Anniversary with my Wife this weekend) but if I have time I'll take a peek at it tomorrow. Got it today, quite fast for overseas shipping! First time seeing an Astrocade box... Odd thing, certainly not means to be kept, being how unintuitive they are. Mine have a sticker for "Space Fortress 2012" on the side. was that for a previous release? Two available, then I am out of original boxes. I am going to have to appologize to a couple of you but I need to put the sales of Treasure Cove on hold. I am out of original boxes. I will let everyone know when I have a new supply or a new method of packaging. Sorry. My copy just arrived- pure coolness, and the fastest shipping I've ever had on a homebrew! Just got mine, too! Very nice work. Well, my Astrocade still works. Not sure the colors were right, but between the S-video mod and those TV being for the European market, it's hard for me to know the "right" colors. If anyone know a workable replacement for the PSU, contact me. I played it for 2 hours, and when I stopped, the PSU was burning hot. As I was worried about, it doesn't take the 50 htz very well. Received mine - very nicely done!